The Land of Narnia by Brian Sibley. I picked up a copy of this one at Goodwill as well in order to pass it along to one of you. - A timeline of the history of Narnia. - Several pages of explanation and a description of each book in the series. - Lots of photographs and illustrations. Would you like to win? Well, you know the ropes! Simply leave a comment below. This contest is open to U.S. and Canadian residents. If you are participating in the challenge and have written up a post on your blog saying so, you may leave TWO comments for two separate entries. This contest will be open through Thursday, August 2nd. 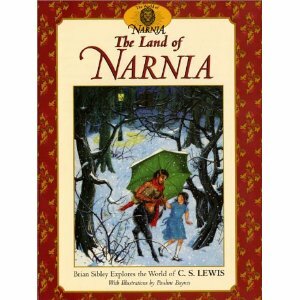 I think this would be a great addition to our growing Narnia collection! I wonder if they meant to say this was good for grades 1 and up instead of age 1 and up? I'd be interested in reading the book, so please enter me. I wpuld like to add this to my Nardia collection! I'm in! Just not online as much as usual! My boys would love this book! Just an FYI (not sure if you have sent it yet) but I haven't received Prince Caspian yet. Just wanted to make sure it isn't lost. Thank you again!